Kingpin was originally released in 1996, between the Farrelly brothers' two biggest box office hits as comedy directors, their debut film Dumb and Dumber and There's Something About Mary. To date, Kingpin remains their lowest grossing film in theaters (ignoring their contribution to Osmosis Jones, which isn't hard to do). And yet, Kingpin is easily one of the duo's best films and probably the one that has aged the best of those first three releases. Viewed nearly twenty years later, the most striking aspect of the film is not the gross-out gags, which are commonly associated with the Farrellys. Instead, Kingpin seems unique among broad comedies for the pacing of the script (credited to TV writers Mort Nathan and Barry Fanaro, though no doubt polished by the directors), which patiently develops its characters and grounds them, making the outrageousness of the jokes even funnier. Most folks who have seen Kingpin remember Woody Harrelson's chameleonic turn as an alcoholic, overweight, one-handed, past-his-prime professional bowler with a beyond-ridiculous comb-over. But what some might forget is that the film begins with a nearly 12-minute prologue in which we see Harrelson's character, Roy Munson, coming into his own as a bowler before losing it all by wrongly trusting his conniving competitor Ernie "Big Ern" McCracken (a gleefully cruel Bill Murray). We see how he lost his right hand and how the bottle ended up in his left, which makes his present-day predicament more painful -- and, by extension, funnier. The comedy doesn't come flying at a gag-a-second, but by often taking its time, the film achieves a pleasantly high hit-to-miss ratio. There's a surprising variety to the style of jokes as well, such as character-based moments (Roy is dismayed to learn that "getting Munsoned" has become a widely used term for blowing a big chance), silly wordplay ("Whatcha doin', Mr Munson?" "Flossin'." "Flossin? Where'd I get Munson from? "), gross-out gags (after milking Ishmael's family cow, Roy is informed the family only has a bull), slapstick (Roy does a lot of unintentional damage with his prosthetic hook), and left-field non sequiturs (the big entertainment attraction in Reno is a production of "The Jeffersons on Ice"). And while Kingpin features a more mature approach to storytelling than Dumb and Dumber, the Farrellys still know their primary audience is 12-year-old boys of all ages, so there are plenty of shots of guys getting hit in the nuts and (much to my girlfriend's consternation, when we just watched the movie) women's breasts getting ogled, fondled, and generally mistreated. 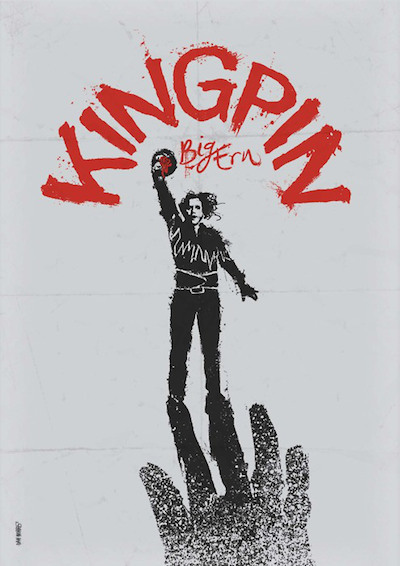 At its core, Kingpin is a solidly structured redemption story that also happens to zig in many places audiences might expect it to zag. Maybe that's why the film didn't set the box office on fire, but went on to become a giant cult hit on home video and cable television. Kingpin is both better and stranger than one would expect based on the movies the Farrellys made before and since. It's the kind of film viewers hold dear for existing off the beaten path without exactly being obscure (Jonathan Lynn's movie version of Clue comes to mind as another one). Kingpin will never make the AFI's list of Top 100 Comedies (despite making Siskel's Top Ten back in '96), but it looks like it has the legs to stay relevant for comedy fans for at least two more decades, for sure. Paramount's Blu-ray includes both the PG-13 theatrical version of the film and the R-rated extended version from the 1999 DVD release. The difference between the two cuts is around four minutes. The added footage seems more often like it was cut for pacing, rather than raunchiness, although there is a gag with a blow-up doll, a minor extension of the Indecent Proposal parody, and a shot of male butts that might have specifically been the R-rated straws that broke the MPAA's back. Both cuts are plenty funny, with neither being particularly preferable to the other. The Blu-ray offers a seemingly accurate reproduction of Mark Irwin's cinematography, which means that the AVC-encoded 1080p 2.35:1 transfer features strong colors and deep black levels, with plenty of information discernible in the shadows. Skin tones are accurate. However, the movie itself is not great looking. While the scenes in Amish country have a certain lushness, most of the movie takes place in intentionally cruddy-looking bowling alleys and rundown apartments. It's not a movie that subscribes to the idea that a comedy needs to be bright and clean-looking, and the grungy, sometimes soft look is clearly in-line with the filmmakers' intentions. So while the disc has a solid HD transfer, it's hard to really describe the video as "crisp" or "attractive." The main soundtrack comes in an English DTS-HD MA 5.1 mix, and it sounds perfectly fine. It's not particularly dynamic, although there is generally a layer of atmosphere in the surround channels throughout, and the many source music cues sound good in surround. The disc also offers lossy French Dolby 2.0 and Spanish Dolby 2.0 audio options, and the following subtitle options: English, English SDH, French, and Spanish. Audio commentary by directors Peter & Bobby Farrelly - This is available on the R-rated version only, and has been ported over from the original DVD. As one might expect, the Farrellys just sound like regular guys who have a good time making movies. They tend to point out their many friends who are extras or have small parts throughout the film, while also providing plenty of production anecdotes. It's actually a quite useful track for listeners interested in knowing the nuts and bolts of the filmmaking process. Kingpins: Extra Frames With The Farrelly Brothers (HD, 19:14) - A newly shot featurette, in which the Farrellys reminisce in between frames of bowling (Peter clobbers the gutterball-prone Bobby). Interwoven with bits of on-set footage and vintage 1995 interviews with the cast, this is a snappy and informative piece that never takes itself too seriously while doling interesting nuggets about the film. For instance, Randy Quaid was the person who managed to get Bill Murray to agree to be in the film, because he was one of the few people who actually had the actor's direct phone number. Definitely a worthwhile new bonus. It's hard to believe Kingpin hasn't already been released on Blu-ray. Well, better late than never. Recommended.